My morning started with birds visiting our yard. The sun cleared the hill behind our house, and the birds became more active. I started taking pictures as the sun cleared the strip pit behind our house. 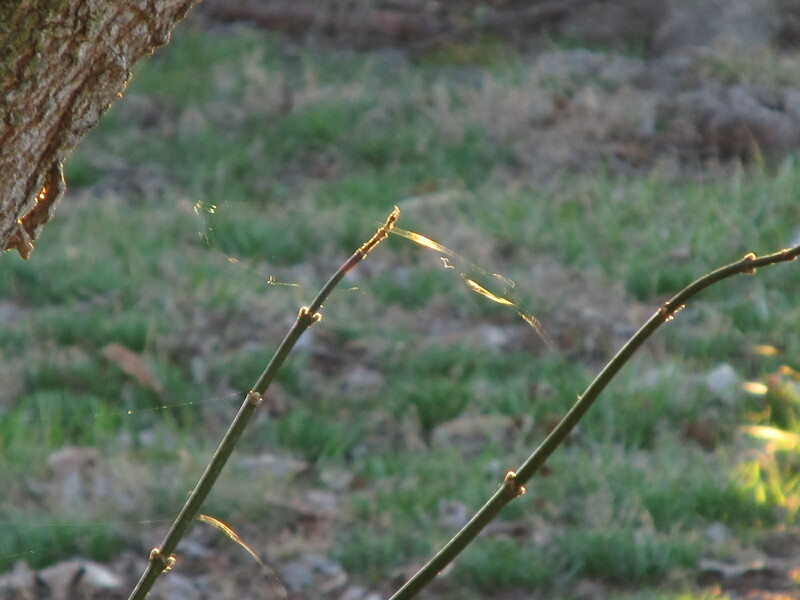 I took pictures of the sunlight brightening the emerging leaves in the hackberry tree, the pine and the sweetgum trees. 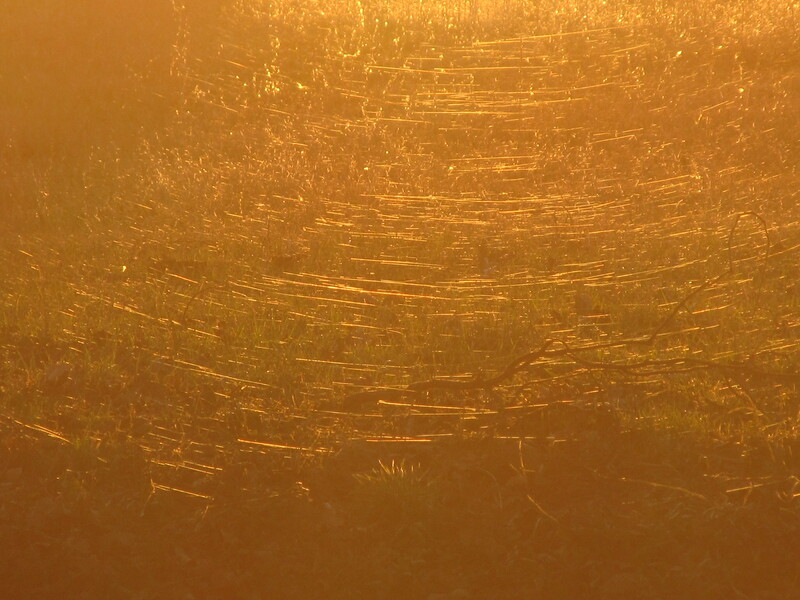 The sunlight lit the few strands of spider silk and changed their colors to mostly orange. I like the depth of the layered image of branches and new flowers emerging among them. 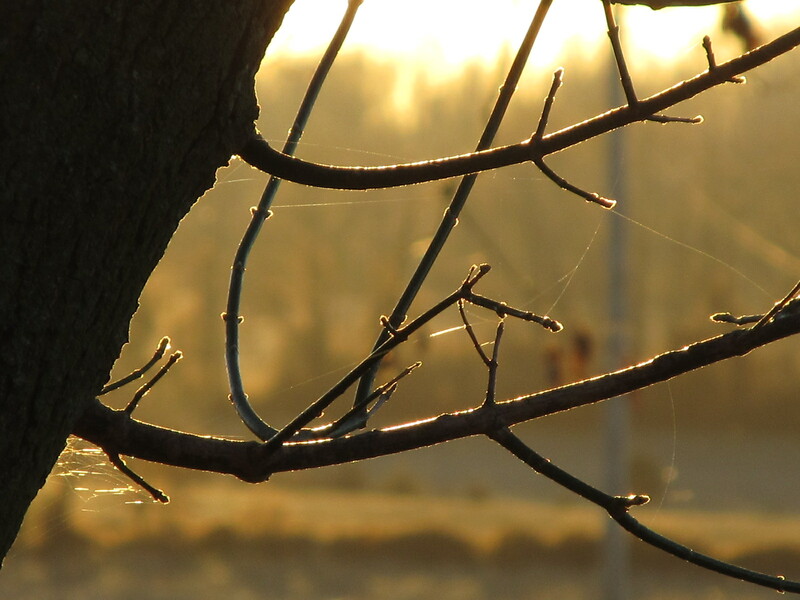 It’s warmed up now at the end of January, and I’m seeing increasing number of strands of spider silk. I see the most connecting the tall grasses in the field across the highway. 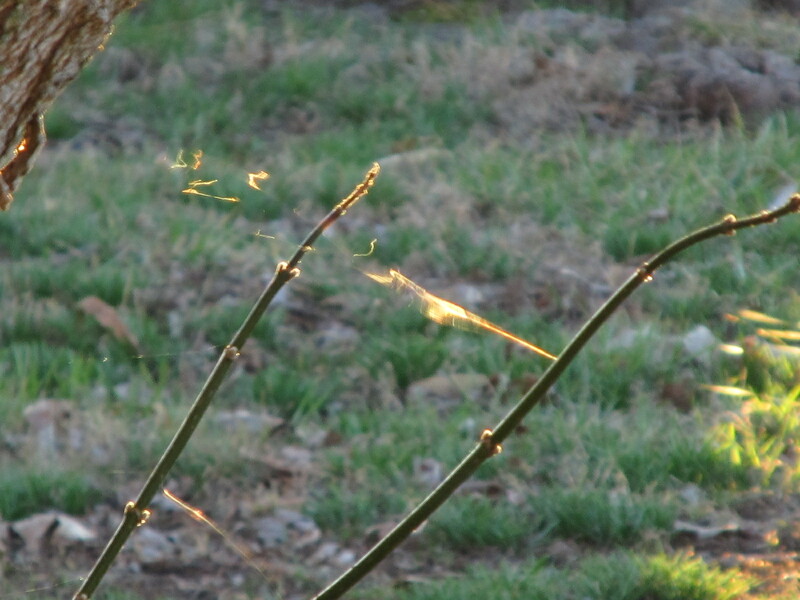 the reflected sunlight “slides” back and forth along any longer strands. The spiders let out a length of silk. It grows longer and longer until it attaches to an object, like the wood above. The silk really shows up in the evening light. 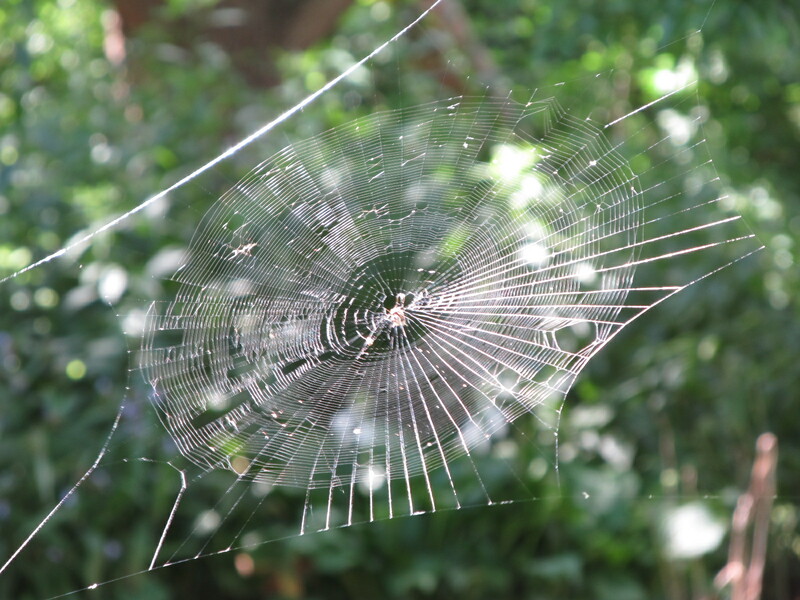 Spiders can let out much longer strands than the one above. 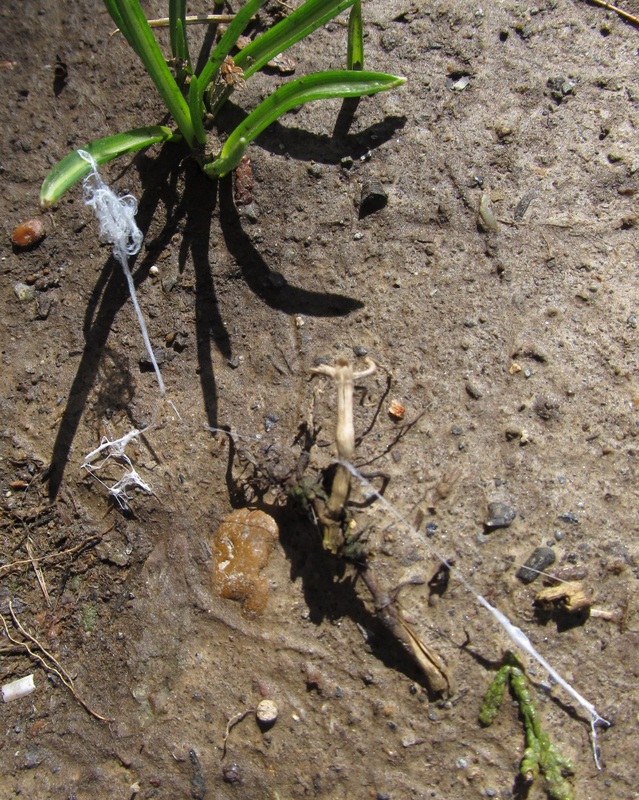 These two were probably from the same spider. The light slides back and forth along the silk, and the sun reflects the light in different colors. A strong storm system went through before sunset last night. and was shocked at the size of a spider web stretching from the pine tree to a vine on part of my rock pile. Teeny beads of dew lined all the strands of the web. Clouds didn’t detract from the web’s sparkling appearance. The web measured 3 to 4 feet tall … or more. I was too fascinated to think about its height. I wondered just how long it would take a spider to weave a web of that size. before the spider “took” the web down for the day. Today started out sounding like spring with a robin loudly singing in our front yard, and a great horned owl hooting to the north. The kitchen sink isn’t exactly my favorite place to be, but I often see interesting things while there. The window faces west. Strands of silk drifted in on a light breeze and landed close to the porch. 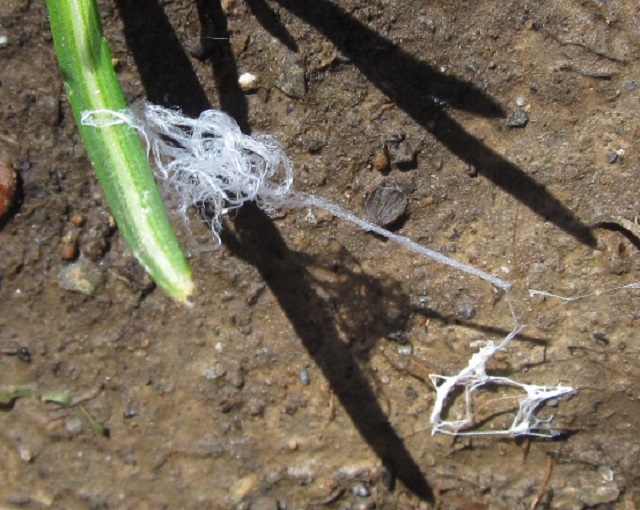 The silk measured approximately 3 1/4 inches long. 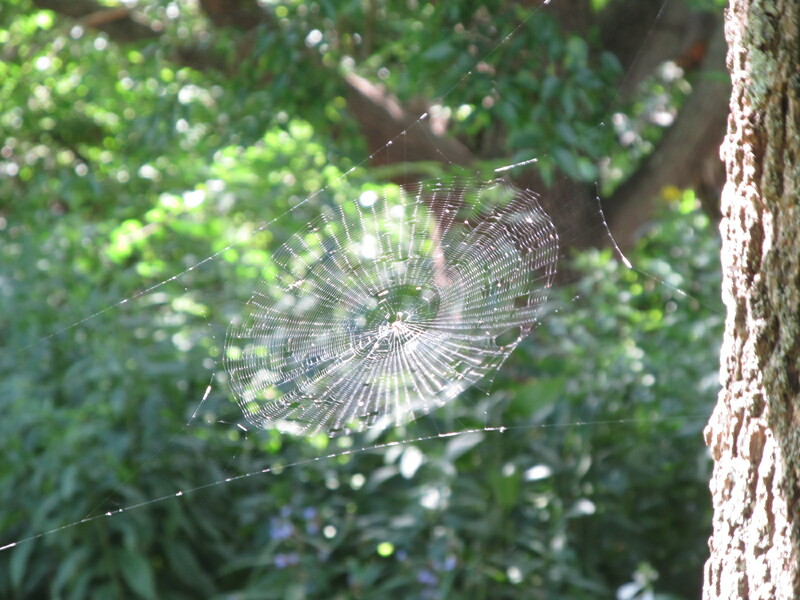 I first suspected an adult spider had spun it because of the size of the silk … only adult spiders wouldn’t do this. 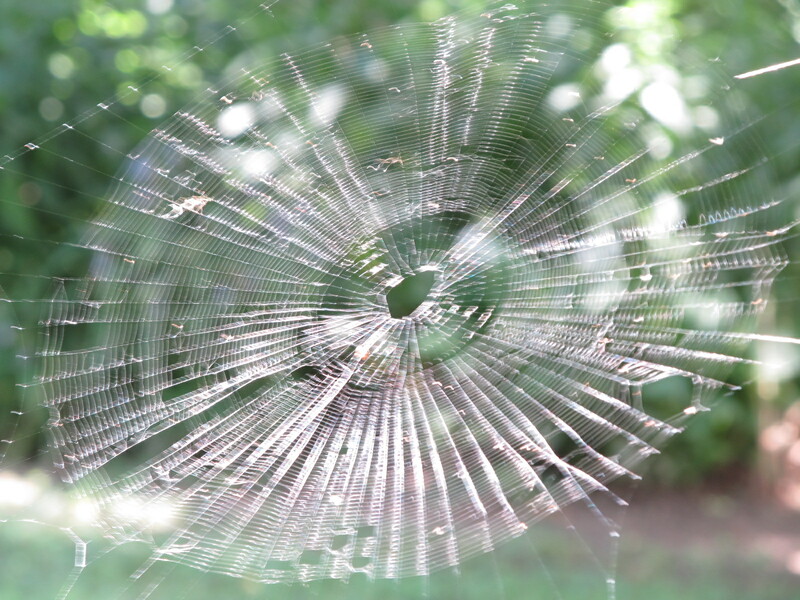 Spiderlings produce silk but don’t build a web. Maybe it was the spiderling of a larger species of spider. Today turned out to be a sunny day with the temperature reaching 67. An eastern phoebe repeated its name in the backyard this afternoon. So…. our days finally look and feel much more like spring is here in southern Illinois! The spiders had a surprise waiting for me in the evening. 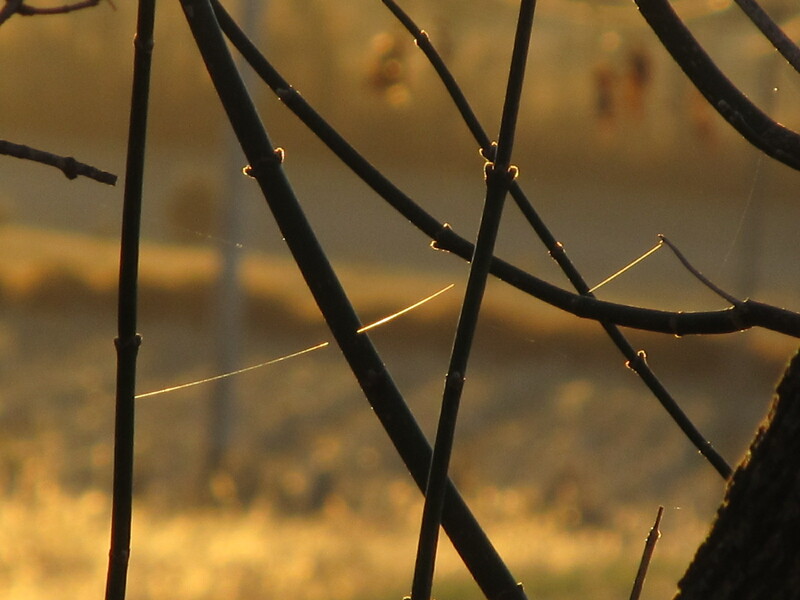 The sun was getting lower, and I noticed spider silk reflecting the sunlight. I hurried out in the front yard with my camera. A light breeze added movement to the single strands of silk. The camera seemed to have a mind of its own as to how the pictures turned out. I just snapped and snapped pictures with the light quickly changing. Then I noticed the dramatic effect on the other side of the highway. I stood on our hill and zoomed in for closer pictures of across the road. The speed of the sun lowering in the sky didn’t give me much time to do anything but quickly snap pictures. The reflected light shimmered with a light breeze. 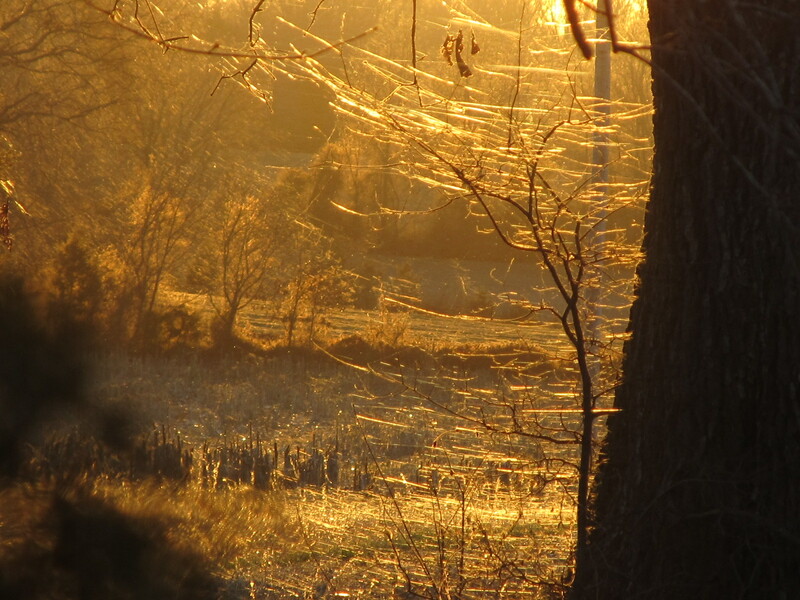 Everywhere I looked, and as far as I could see, there were strands of spider silk. 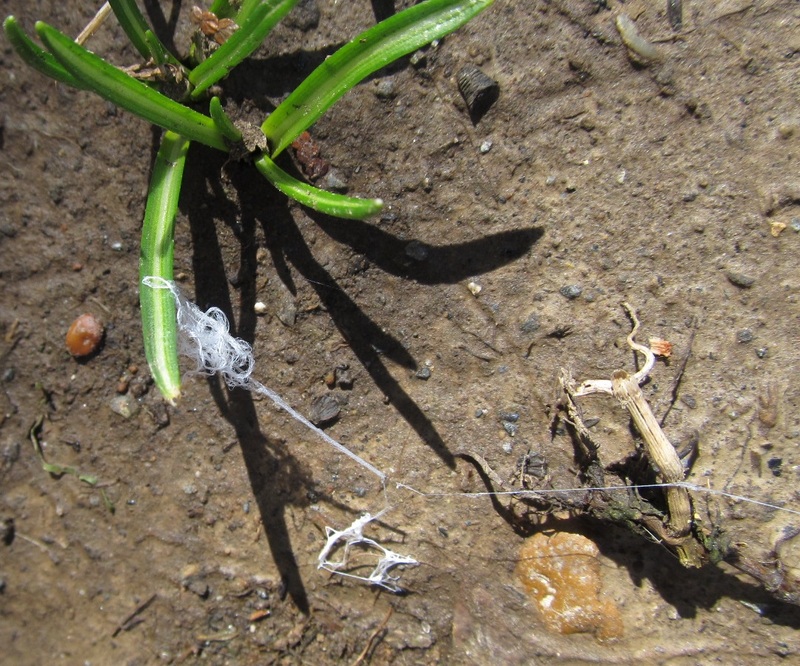 The breezes moved the spiderlings’ strands in the trees, grass and other dried vegetation. I took thirty-eight pictures in eleven minutes before the sun sank to the horizon. Then, when I remembered to check the next day, every bit of the spiders’ silk was gone. I can’t imagine what the sky looked like with so many ballooning spiderlings! I sure wish I’d seen it!